Stopping by the local beverage emporrium on my way home from work last Wednesday, I had it in my mind to pick up (only) a couple of seasonal beers with which to celebrate over the Thanksgiving holiday. My plan was to let the store displays guide my decision. I would pick just two beers and not give in to temptation and walk out with extra impulse purchases. I headed to the "holiday" beer corner and immediately spied a stack of Sierra Nevada Celebration. My first pick was decided, now to look for something in the maltier range. I noticed that the store employees were clustered around someone doing a tasting so I wandered over. There was a young lady pouring beers from Starr Hill Brewery. She had the Boxcarr Pumpkin Porter and Snow Blind Dobblebock available to sample. After a sip from the tiny medicine cup offered, I had my second choice in hand. 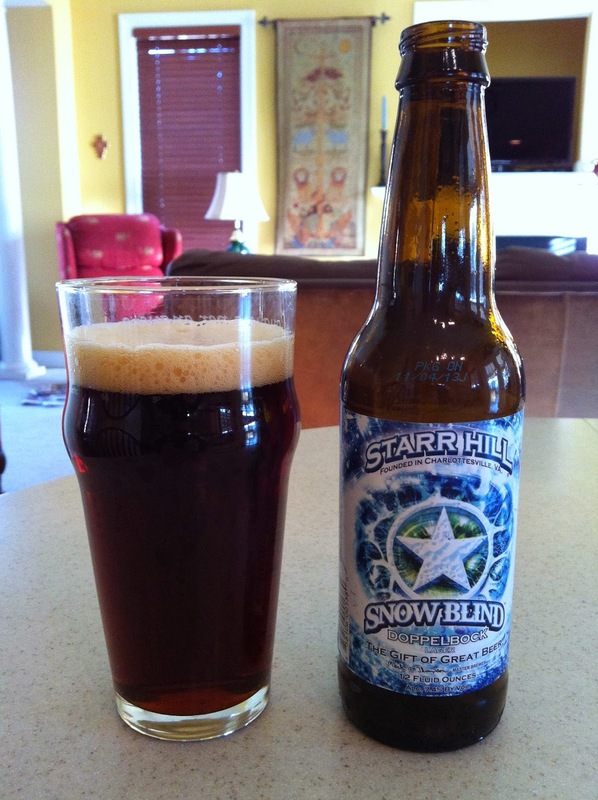 Snow Blind is a new Winter seasonal from Starr Hill. According to the brewery's website it was released on November 15. The bottle is stamped with a bottling date of November 3, freshness is another reason to drink locally brewed beer. The beer pours a deep, caramel brown, with a reddish tint that shows as the light comes through the glass. The beige head is thin and short-lived. The aroma of the beer is mild with sweet malt, with dark fruit and a hint of licorice. The flavor is earthy, caramel, lightly sweet and toasted, with a touch of spiciness. The finish is dry, clean, and little aftertaste is left behind. At 7.4% ABV there is only faint alcohol flavor noticeable. 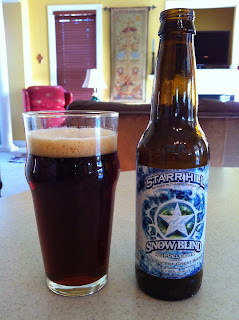 I enjoyed my post-range trip glass of Starr Hill Snow Blind very much. I think this will be one we keep on hand over the Winter. Oh, and I did succumb to just one impulse purchase during my shopping trip. I grabbed a bottle of Northern Hemisphere Harvest Wet Hop Ale from Sierra Nevada. But that's a story for another post.